Our beloved neighbours are moving this week. They welcomed us when we moved here nearly 10 years ago, treated us like their own children, and embraced our kidlets like another set of grandkids. We've shared many a bottle of wine and Sunday dinner. I've taken care of their cat, and I hate cats. But we would do anything for them. So when he showed up with this random box on the weekend I couldn't help but say yes when the last thing I need is any more stuff in my house. Besides, the less they move the better. I'm a good neighbour until the end. What a treat to dive into this box! Patterns, notions, fabric, and so much more. 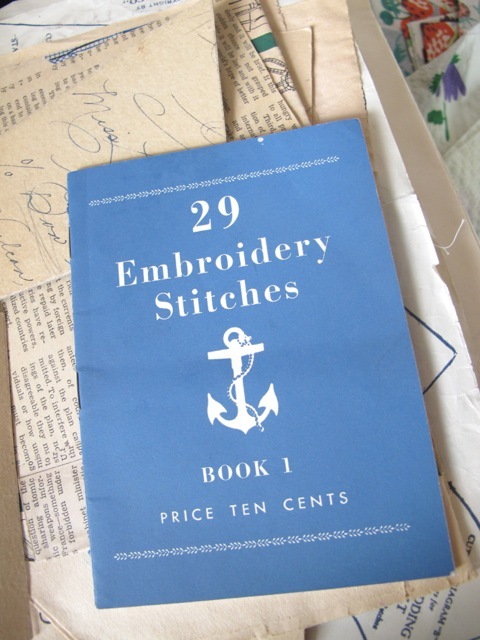 A bit of history of someone who sewed in their family. And a bit of sewing history. 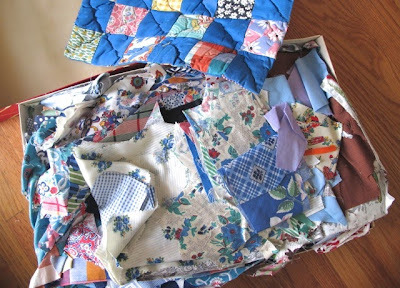 Loads of fabric scraps! My guess is that the fabrics range from the 30s-60s. Not sure of the fibre content of much of it, but some pretty sweet fabric. There is a lot more than what you see here. 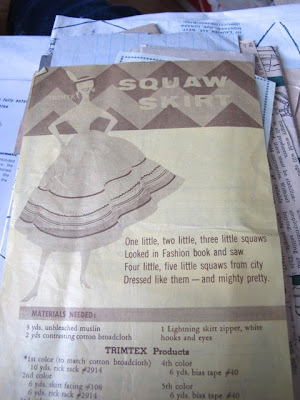 A few sewing patterns. This horribly offensive one too. Interestingly, I think there is a nearly finished version of this skirt in the box (just missing the waistband) and it is gorgeous. Actually, there are a few nearly finished articles of clothing. And clearly they were made by someone with the tiniest waist ever. I doubt I would get anything over one of my thighs! But, oh, the fabric. A quick glance at this makes me laugh because it encompasses a lot of what a produced, slick book includes these days. Only 10 cents! I'll be keeping this one for reference for sure. Vintage zippers anyone? If only I knew how to sew in a zipper. There were these and so many more trims and notions. Fun little bits and bobs for clothing. And they are sitting on this funky yarn pillow. Sadly, it has seen better days, but still pretty cool. Then there was this! Roughly twin sized and made quite nicely. Full of fabrics that make me drool and get excited. 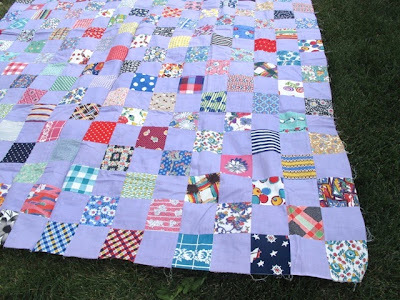 I plan to finish up this into a lovely quilt. Seeing as the box came from a family member - they think a great aunt - I think this should go back to the family. My neighbours' daughter and husband like it so hopefully it will make it's way back to them by Christmas. What a find, and a what a treat to explore someone else's bit of history. Quilting Pieces indeed. Neighbors are like a box of chocolates... sorry to hear you are loosing the sweetest kind. 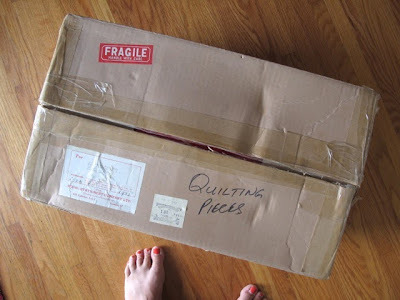 Interesting mystery box - it's a quilty kind of voyeurism to look through another sewists box of goodies. how cool! and its not even Christmas!! I would love to see more of the centennial quilting bee. 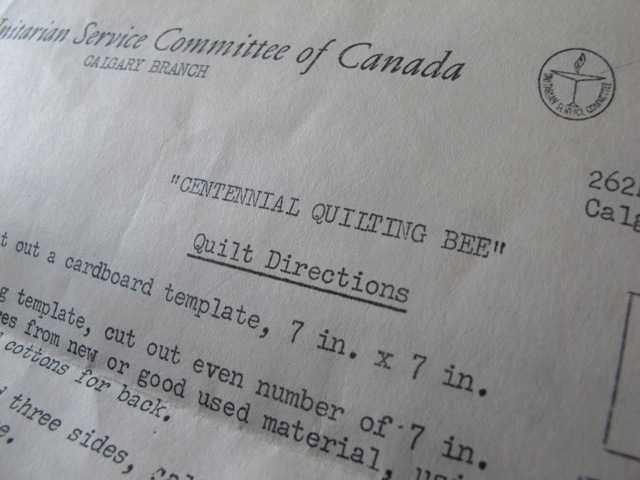 In my family, my sister (born in 1967) was "our" centennial project! What a treasure! So sorry to hear that you are losing such great neighbors and I hope your new ones turn out to be special, as well. How lovely to have something so wonderful to remember them by. And just for the record... zippers, (the sewing them in part) makes my head spin. My daughter can sew a zipper in with her eyes practically shut...me, clueless... I've done it, but never with ease, and I never remember how. What great neighbours and what a fun box. I would be happy to show you how to tackle a zipper sometime, your curves are much harder. I hope you have fun with the box and can still keep in touch with the neighbours. Oh zippers! 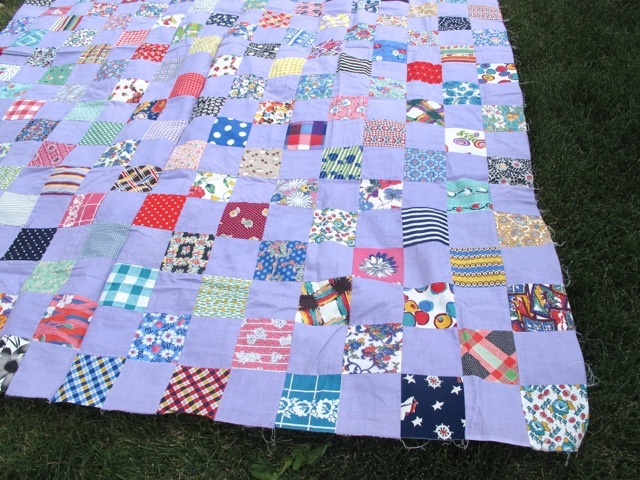 And that quilt top! 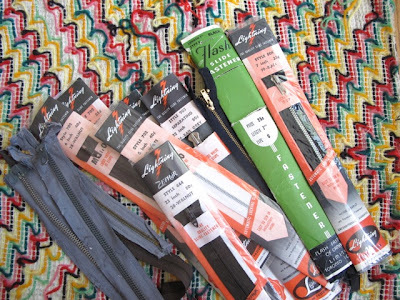 True story... when I invaded my Mom's sewing room (which I guarded by a troll who lets NOTHING leave,that would be my sister) I found my mom's stash of zippers and took every single one! I think I am down to the last dozen. Cant wait to see you finish up the top! They will be thrilled I'm sure! I'm a sucker for a box like that. Such treasure! Enjoy! Fabulous box! Thank you for sharing the treasures with us! What a wonderful box full of treasure for a quilter and even more special that you plan to finish up the quilt and get back into the family. Wow that really was a treat box! Wow! What a treasure trove! It must be so inspiring to dig through all of this - have fun!